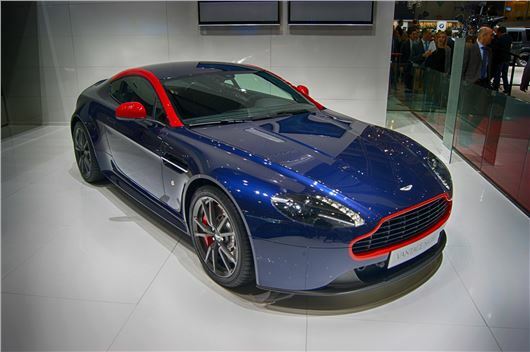 The Aston Martin V8 Vantage N430 track car and DB9 Carbon special editions have made their debuts at the Geneva Motor Show. The new cars, which have been introduced to maintain appeal for these ageing super sports cars combine motor sport heritage and uprated performance. The GT4-inspired N430 (above) is available in coupe or roadster form and is powered by an all-alloy 4.7-litre quad overhead cam engine with 436PS. Aston Martin claims the uprated V8 Vantage will cover 0-60mph in 4.6 seconds, before galloping on to a top speed of 190mph. Power is delivered to the rear wheels via a six-speed manual gearbox, although a close-ratio seven-speed automated manual will be available as an option. The rear-wheel drive racer is 20kg lighter than the standard V8 Vantage, with carbon fibre and Kevlar seats and ten-spoke forged alloy wheels. Black magnesium paddle shifters and a carbon fibre facia trim are also among the interior improvements. The N430 also gets a number of visual tweaks, with jet black front grille, headlamp bezels, exterior meshes, side window surrounds and tailpipe finishers. The DB9 Carbon (below) is more of a cosmetic exercise, with the special edition available in white or black. Power comes from the DB9’s standard 6.0-litre V12, which is capable of topping 183mph, but visual changes include carbon fibre side strakes, front splitter and black window surrounds. Price and delivery for the DB9 Carbon are still to be confirmed, but the N430 track will reach the UK in September with prices starting at £90,000.